True, everyone has a preferred way of holding their wine bottle, champagne bottle or wine glass but, humor aside, there is a universally accepted, proper etiquette for wine tasting. Once poured into the appropriate glass, it’s time to properly evaluate and enjoy the wine. The key is to appreciate the five key attributes that make up the structure of a wine – sugar, acid, alcohol, tannins, and the texture – and it involves four basic steps: looking, swirling, smelling and tasting. Begin by holding the wine glass by the stem with the thumb and one or two fingers, so that no body heat is transmitted to the glass. Take a close look at the wine, before putting the olfactory senses or taste buds to work; observe and pick up clues about the structure and flavor. Lifting the glass up to light, make note of the color and the intensity of the wine. Reds range in color from deep purple to brick red. White wines range from lemon-gold to a rich, golden amber and usually darken with age, while reds tend to fade in color over time. A good wine tends to be bright, with the color fading slightly near the rim of the glass. Next, rotate the wrist in a few swift circles, swirling the wine to observe how much adheres to the sides of the glass. Observe the speed and the width of the droplets or “legs” that roll down. The more the legs are visible, the more viscous is the wine, indicating body and higher alcohol content. Swirling also serves to aerate the wine, releasing its aroma. To properly sense the aroma, tip the glass until it is nearly parallel to the floor, take a short sniff and concentrate on the result. Swirl again to release additional aromas. Pay special attention to similarities with familiar smells – rose petals, citrus fruit, tobacco, cherries… Mature wines tend to have more subtle aromas than younger ones, and they tend to reveal their “layers” over time. Finally, sip and swish the wine around the mouth. This should better release its aroma and coat the mouth. Does tasting the wine confirm our interpretation of the wine’s bouquet? How much we salivate after sipping the wine tells us about the level of acidity; the higher the acidity, the more saliva is generated – essentially saliva acts an agent to buffer and neutralize the harshness of the acid. Observe how far into the mouth and throat the burning sensation of the alcohol is felt. If limited only to the tongue, it is an indication of a lower alcohol content. 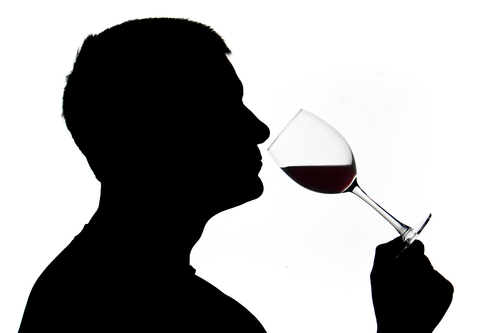 The sensation extending to the back of the throat and jaw is an indication of medium alcohol content while a warming that extends to the sternum suggests a wine of perhaps 14-15% alcohol content. Lastly, note how long the flavor lasts after swallowing. This is called the finish or the length. The longer the persistence of flavor after swallowing, the better the wine. Budget sips and sniffs by using the spit bucket, as tasting the same samples many times in succession results, according to oenologists, in a total loss of sensitivity. Wineries generally have some six to nine wines on their tasting menu, beginning with whites and ending with the heaviest reds or desert wines. The tasting menu is usually accompanied by notes prepared by the winemaker. These notes serve as a useful reference, as we do our own evaluation of the wines and come up with our own observations.